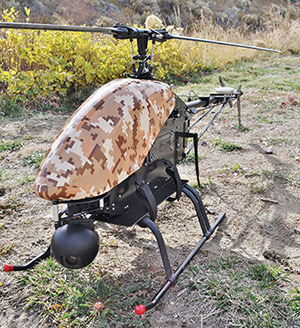 The Avenger™ helicopter is a efficient high-performance platform for high or low altitude surveillance, photography and sensor deployment. 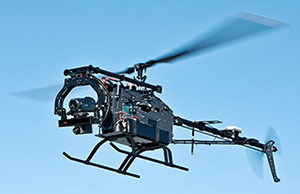 The Avenger offers a fully featured flight system and military grade ground station. Battery propulsion means no power loss and quiet operation with easy field charging. 19.75 in. x 58 in. The Leptron Avenger™ offers simplicity with a single case for the helicopter, video, spare batteries and charger. The Leptron Avenger™ illustrates the simplicity of flight via the wireless remote control. The Avenger autopilot is making 500 flight corrections a second that allows the user to fly the Avenger in even the most challenging weather conditions. The system also illustrates the automated safety element of the 'return home' function to the original GPS location within 12 inches. 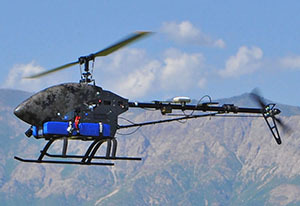 The Leptron Avenger demonstrates its handling in extreme weather conditions of 110 degrees and 10 MPH winds to -10 degrees and 15 MPH winds in snow to 11,990 feet altitude and 55 MPH wind gusts.